The Real Value of Gold for Preppers: Better Than Stocks and Cash? Home Survivalist Tutorials Financial Planning for Preppers 101 The Real Value of Gold for Preppers: Is It Better Than Stocks and Cash? Should a calamitous disaster, such as hyperinflation or an electromagnetic pulse attack result in the collapse of our financial systems, our currency will almost certainly collapse. Any dollar denominated investment, such as bonds and many equities, will become worthless. Gold is the obvious currency substitute, and even it will have some limited value in a post-calamity society where food and essential supplies will be in more demand as a bartering currency. But as most other assets, such as real estate and stocks, succumb to the pressure of panic selling, gold will hold its value, or more likely, surge in price, as the world scrambles to build its reserves. The time to accumulate gold is in preparation for a calamity. In the aftermath, gold will be difficult to buy, and its price will surge as it did during the hyperinflation of the Weimar Republic. As the value of the US dollar turns negative, you couldn’t possibly have enough of it to buy an ounce. If you wait until you are in the teeth of the monster to convert other assets into gold, your wealth will be devoured. 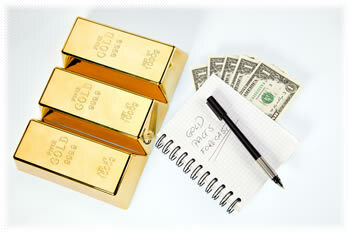 During an economic collapse, gold will serve two very crucial purposes. It will be one of the few acceptable forms of real currency, and it will be one of the very few ways of preserving wealth throughout the cycle. As a currency, it will have some value as a means of acquiring goods and services. Its greater value will be as a means to reacquire assets, such as real estate and stocks, when the opportunities present themselves later on in the cycle. In the right circumstances, gold will prove to be the most valuable and the most reliable currency in a collapsed economy. For that reason, having a stash of gold coins will be essential for any chance of maintaining an adequate standard of living. The advantage of holding gold coins is that they are more easily divisible and fairly easy to store. Two fists full of gold coins could provide sustenance and shelter for a long time. Accumulating gold coins can be done gradually, and with the advent of online dealers, it can be done from the comfort of your home. It is recommended that you avoid the large dealers who spend an enormous amount of money advertising on television, as they tend to charge higher premiums. Reputable firms are well established and charge a fixed amount over the spot price. Safe-keeping and storage can be an issue as stores of any commodity deemed to have value will be targets for unrelenting assaults by thieves and desperate neighbors. Coins can be hidden in any number of nooks and crannies; however, consideration needs to be given to building a well-hidden, vaulted storage facility that will protect your wealth from theft, disasters and nosy neighbors. The safest and more secure way to own gold at any time is in its physical form. Gold is nearly indestructible, uniform in its content, and always convertible into other currencies or goods. The primary issue for holding physical gold is its storage and safekeeping. The portion of your gold holdings that you are able to hold outside of your need for currency, needs to be stored safely, offsite in multiple locations, preferably outside of the U.S.A. Unless you are a multimillionaire jet-setter, this can be difficult to do. The newest entrant into the online gold marketplace is electronic or digital gold dealers that enable you to buy units of gold online. The gold can be purchased in any form of bullion and accumulated in an account as “units”, fully backed by physical gold held in secure vaults, which can be converted into any denomination or form of gold for delivery to your doorstep. The net asset value of your account is net of storage and premium costs. Some sites allow you to set up individual accounts earmarked for different objectives, such as college education, or retirement.